The details were reported on Monday by DigiTimes, which cited its usual sources from Apple's suppliers in the Far East. The publication claims that Apple's anticipated 12.9-inch iPad will target the educational market in North America. 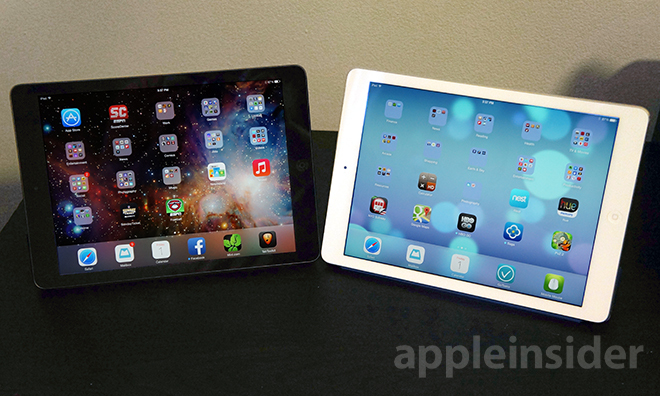 According to the report, Quanta Computer will manufacture the larger iPad. Apple is said to have been considering panel sizes of 12.9 inches or 13.3 inches, and is most likely to adopt the smaller screen size. In addition, a larger iPhone using a 20-nanometer processor is also rumored to launch in May of 2014, according to the report. That phone's chip will reportedly run a processor designed by Taiwan Semiconductor Manufacturing Company. The 12.9-inch screen size has been rumored for a future, bigger iPad on multiple occasions, though some reports have pegged such a device for an earlier launch in 2014. Apple's interest in a bigger iPad is said to be driven by the fact that tablets are continuously replacing traditional notebook PCs in the consumer market. Such reports are not limited to overseas publications, as The Wall Street Journal reported in July that Apple was toying with larger screen sizes on its best selling devices. Specifically, it said that Apple had built a prototype iPad with a screen size slightly less than 13 inches diagonally, putting it in a class with a MacBook display. As for a larger iPhone, rumors have suggested Apple is toying with a design with a 4.9-inch display that the company could debut in 2014. Apple previously increased the size of the iPhone screen in 2012, when the iPhone 5 debuted with a 4-inch screen. Noted analyst Ming-Chi Kuo of KGI Securities said in September that Apple is planning to launch a handset with a screen sized between 4.5 and 5 inches in 2014. According to Kuo, anything larger than 5 inches is unlikely, due to the company's Unwavering principle of one-hand use." So-called big-screen "phablets" have become increasingly popular in recent years, with Samsung leading the way in terms of selection. The Korean firm's Galaxy Note III features a 5.7-inch display, while the Galaxy Mega comes close to being a small tablet with a 6.3-inch screen.